Psalm 1 ("Beatus vir", "Blessed is the man") is nearly always the most decorated in medieval psalters. 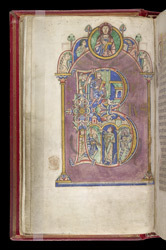 In the Shaftesbury Psalter, its first letter fills nearly the entire page. Originally the first words, now barely visible, were written in gold below the 'B'. Within the letter, King David is shown, holding a book and looking up to the bust of Christ and the four creatures (symbols of the four gospels) above. He is composing the psalms, seen here as prophecy of Jesus and the gospels. Behind him, scribes record his words on wax tablets and below three musicians accompany him--one of them resembling a fur-bearing devil.